This week we're presenting the The Yale Center for British Art, Isabella Stewart Gardner Museum, and Heritage Museum and Gardens that offer interaction with landscape, architecture, sculpture and environmental sound to engage in examinations of locational specifics and the conditions of space. 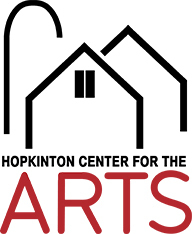 Artscope is excited to be sponsoring New England on Paper, Contemporary Art in the Boston Athenaeum's Print and Photography Collection and Makers in the Round happening today, April 20, at the Cyclorama hosted by Society of Arts and Crafts Craftboston. Additionally, we're sponsoring the Arlington International Film Festival Annual Poster Contest which hosts a press announcement and reception on Friday, April 28 and the Copley Society of Art hosting its 29th annual Fresh Paint Gala and Silent Auction on Thursday, May 4 from 6:30-8:30pm, both of which are events you won't want to miss. Lastly, the Groton School's Christopher Brodigan Gallery will be hosting an artist talk by Syrian-born artist Mohamad Hafez about the exhibition Homeland inSecurity on May 7 at 2 p.m. For more information click here. The Yale Center for British Art presents Art in Focus: The British Castle-A Symbol in Stone. On view now through August 6, the exhibition is "a selection of paintings that explore the castle in art - its historical role, place in the landscape, architectural development, and literary associations" The curators explain that among the specific castles featured in the exhibition are "Windsor, the largest and oldest inhabited castle in the world and home to the monarch; Corfe Castle, whose ruins after the Civil War serve as a warning that, in a modern democracy, power must bow to the will of the people; and Dover, whose mass kept watch against invasion from France from before the Norman Conquest through to the Second World War. 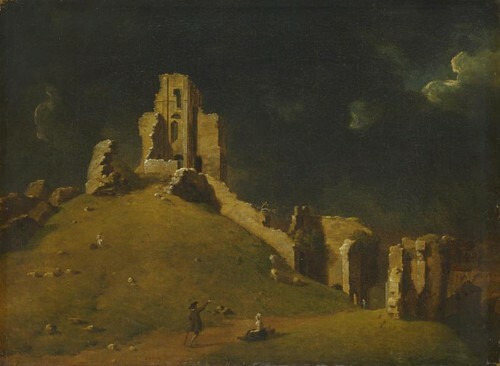 The paintings give insight into castles both real and imagined, and summarize their symbolic role in British life." Corfe Castle which is on the historic Isle of Purbeck in the county of Dorset and founded by William the Conqueror in 1066, is particularly interesting because it's roughly triangular in structure and divided into three parts. This makes it both symbolically and physically important as a fortification. It is the site of the violent and mysterious murder of the young king, Edward, in 978. The painter John Inigo Richards ( 1731-1810), who is sometimes regarded as the "Father of English Landscape Oil Painting," was an established scene painter working in London's theatres during his lifetime. Art in Focus is an annual initiative for Yale Center's Student Guide Program, providing curatorial experience and an introduction to all aspects of exhibition practice. Student curators select objects for exhibition, write text panels and object labels, and make decisions about installation under the supervision of Center curators and staff. For more information about this fascinating exhibition visit the Yale Center's website here. Shop for locally made gifts, visit art and fine craft studios, sample food and drink, and participate in hands-on activities during this self-guided, statewide touring and shopping event. Visit NHOpenDoors.com to plan your tour. Since 1986, Brookline Open Studios has been an annual springtime event, held in locations all over Brookline. This event encourages interaction and creative exchange between artists and offers the community opportunities to experience a range of vibrant and creative works of art. A Preview Show is now on view at the Brookline Main Library - closing public reception on Sunday, April 23 from 1:00-3:30pm. From traditional realist painting to contemporary public art, the Newburyport community embraces the full range of art media and genres. Each ArtWalk is self-guided, free and open to the public. Galleries showcase special exhibitions, artist demos, lectures, tours, refreshments, and inspiring art, all in easy walking distance in our beautiful downtown. "Encounters," "10 MINUTES OF QUIET,"
Vivian Pratt: "Untitled 1702A" (detail of wall installation), paper, wire, plant material,15" x 12" x 4", 2017. From April 5 - 30, Bromfield presents "Enounters" by Vivian Pratt, a photo- sculpture wall installation; "10 MINUTES OF QUIET" by Dietlind Vander Schaaf, paintings that explore spirituality; and "Man in Booth" by Gary Duehr, autobiographical photos about his father. 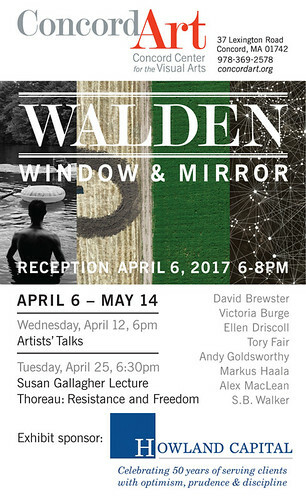 The opening reception is Friday, April 7, from 6-8:30 pm. For 30 years, artist Bill Flynn has been collecting crushed gloves. He is fascinated by the way the random creases reshape each glove into a visually exciting flat piece. Flynn's glove collection served as a major influence for his latest show at the Chandler Gallery: Each drawing borrows the techniques of folding and flattening to incorporate fortuitous rips and edges as part of the finished work. 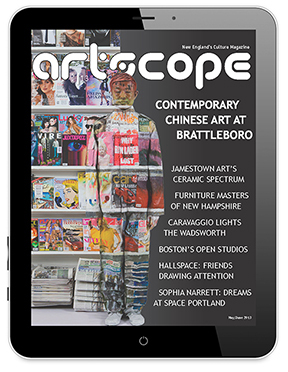 With Artscope on you iPad or iPhone, current art news and coverage is available anywhere, anytime, right at your fingertips. Listen Hear: The Art of Sound is a group exhibition featuring seven constructed sound installations inside the Isabella Stewart Gardner Museum and two off-site pieces of public art. The off-site work, called Fens, a downloadable app, is the most engaging because it generates a number of questions regarding when and how sound and technology become toxic elements and when they are pleasurable and life enhancing. It forces a question: do we want to download another app? Fens is the work of Teri Rueb and Ernst Karel. It is described as an "emplaced, responsive sound piece that introduces another layer onto the palimpsest that is the Back Bay Fens." The other artist that incorporates local places into their work is Helen Mirra. Her piece, Municipals, 2017, is a set of abstracted and deconstructed quadraphonic compositions of location recordings made of the envioronmental sounds from Boston Public Library, Boston City Hall, and "designated urban wilds." Providing a playful mood is Su-Mei Tse, in collaboration with Jean-Lou Majerus, in Sound for Insomniacs, 2007. This piece is an installation of digital prints and multi-media equipment with projection screens showing five real cats interacting with sound. 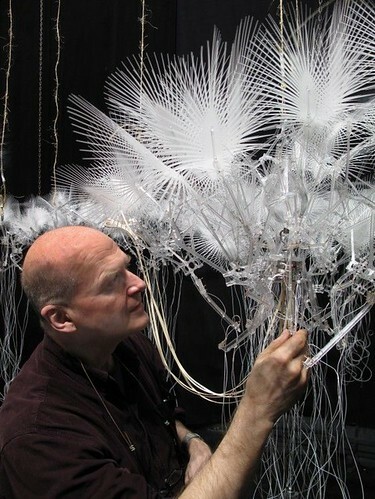 The other artists in Listen Hear: The Art of Sound are Philippe Rahm, Philip Beesley, David Grubbs, Moritz Fehr, Elisa H. Hamilton, Sam Auinger, Bruce Odland, and O+A. Heritage Museum and Gardens opened the 2017 exhibition season with Painted Landscapes: Contemporary Views curated by Lauren Della Monica, featuring paintings by Alex Katz, Paul Resika, Sam Cady, April Gornik, and others. According to the curator, the exhibition offers a range of styles and subjects, and "each artist featured takes acute notice of the physical world at a time of heightened awareness of the landscape, informed by today's concerns, including climate change, environmental health, conservation and the green movement." Although the exhibition subject is traditional, the curator has organized the collection into themes explaining the arrangement as being divided up into " key aspects of what defines landscape paintings, including History & Inspiration (documenting change in America from a rural, agrarian society to the urban populous place it has become, capturing the countryside, the seaside, and all the places artists live and work), Place (whether natural or man-made, urban or rural, real or imagined), Structure & Landscape (either imposed upon the natural landscape through man- made structures or in naturally occurring formal features of the landscape itself), The Tree (depiction of the common and familiar tree), and The Act of Painting (where the subject of "landscape" and the place depicted are almost secondary to the process and stylist choices of the artists)." In addition to painted interpretations of landscape, Heritage Museum's outdoor gardens and grounds are transformed into an exhibition space with Points of View, opening June 3, an installation of mixed media works designed to "enhance the viewer's point of view." Visitors will also have the opportunity to meet the artists and learn more about the exhibitions. 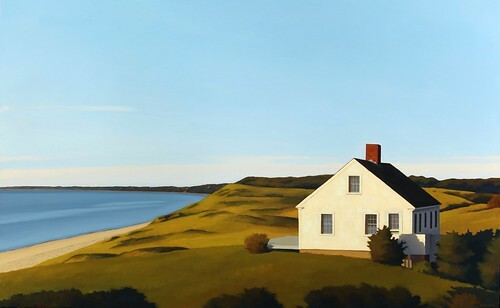 During Artists in Action Days on May 20-21, visitors can watch as the artists install their sculptures; and as part of a more immersive educational program, Heritage Museum is hosting a discussion with artists whose work is on display, as well as Plein Air Painting and Pastel Workshops throughout the season, led by renowned Cape Cod artists. The new expanded programming and exhibition style is part of Heritage Museum's inclusive approach that is focused on audience enjoyment and pleasurable learning. "We're taking our mission of exploration, discovery, and learning to a new level in 2017," said Ellen Spear, President and CEO at Heritage Museums & Gardens. "From the moment visitors arrive, there are multiple options to experience Heritage in fun and engaging ways. Because there's so much to see and do, this season our visitors can enjoy personalized, behind-the-scenes tours that cater to their interests and get them up close and personal with our collections, gardens, and exhibits. They'll even have the opportunity to ride in one of our historic cars." For more comprehensive information visit the Heritage Museum and Gardens website here. 30 portrait artists from the Northeast are showing their portraits. Francesca Anderson has selected featured portraits that are borrowed from homes, offices and City Halls. Over 50 portraits are on view. Portrait photography will be included for the first time. These portraits are not for sale, rather to show as best examples of each artist's work. Sat. May 6 ~ 12-4pm. Call or email for your reservation. More than 50 local artists will present their work. From functional dinnerware to sculptural masterpieces, this popular exhibition has something for everyone. A Mother's Day Weekend tradition! Friday, Saturday, and Sunday, May 12, 13, and 14 from 10:00 am - 7:00 pm. at Willow Spring Vineyards, 840 West Lowell Ave. Haverhill, Ma. Over 40 of Jeff's mixed media experimental art creations will be on display and for sale. Electric saws, chisels and other tools create his exceptional art made from wood, stone, metal, glass and other mixed media. L to R: Adria Arch, Slippery Slope, acrylic on canvas, 60" x 40". Catherine Bertulli , Bozzetti, industrial aluminum foil , 8.5' x 5' x 6'. Patti Brady, Totem, acrylic on Plexiglass, 47" x 33". Senior visual arts students exhibit a body of work they have developed throughout the year-long Senior Concentration Seminar. Participating senior artists are Aiden Duffy, Katie Evans, Emily Mutkoski, John Silveira, Allison Thiel, Mary Welsh, Kei Ving Wong. M-F 10 a.m. - 5 p.m., Sat Noon - 5 p.m.